This Seiko men's Kinetic two-tone titanium bracelet watch with grey dial, date box and 100m water resistance is the perfect timepiece for any modern man. Seiko offers a great range of watches from fashion to sport and technical timepieces styled in the most up-to-date designs. 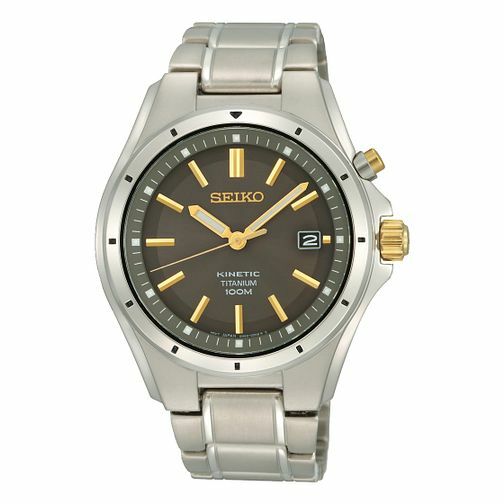 Seiko Kinetic Men's Two Tone Titanium Bracelet Watch is rated 5.0 out of 5 by 2. Rated 5 out of 5 by Anonymous from Seiko watch ordered on line I ordered this watch and when I went to pick it up I found the staff friendly and helpful.